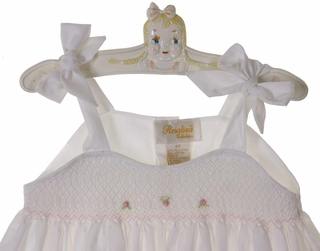 This darling white cotton blend batiste sundress is made by Rosalina, a leading designer of quality childrens' smocked apparel. It features a smocked bodice with pink embroidered rosebuds. With a back buttoned closure and adjustable shoulder ties, this dress is lovely for formal or beach portraits and weddings, too! Grammie's Attic has a lovely collection of special occasion clothing for your baby, toddler, little girl or little boy. 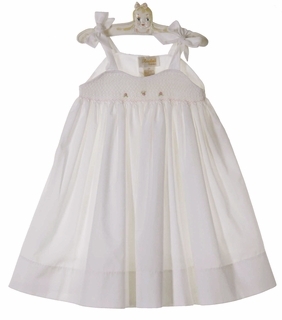 Be sure to see all of our special occasion dresses and special occasion outfits for your baby's, toddler's or little girl's or little boy's most important events, including weddings, birthdays, and portraits.